Almighty Lord, there are many things that cause us to fear and doubt. Through your Word, dispel our doubts and fears and lead us to faith in your gracious promises. Amen. 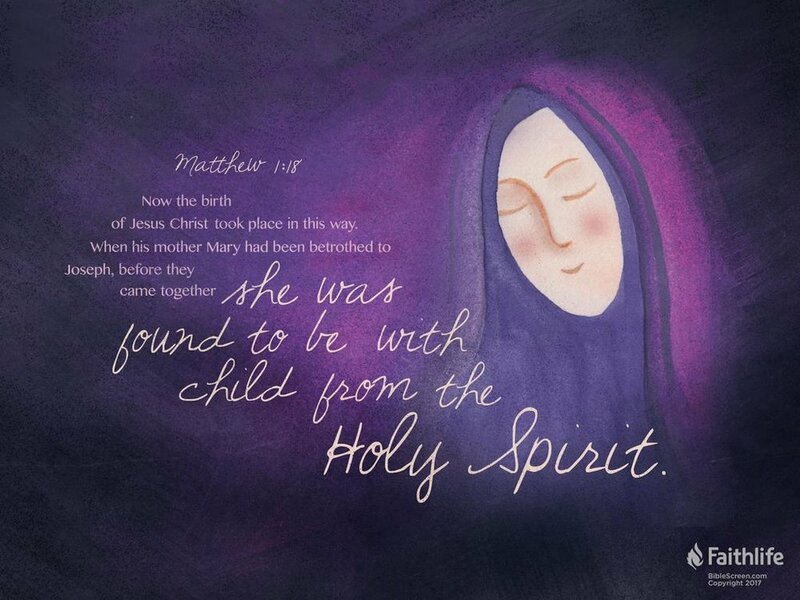 18This is how the birth of Jesus the Messiah came about: His mother Mary was pledged to be married to Joseph, but before they came together, she was found to be pregnant through the Holy Spirit. 19Because Joseph her husband was faithful to the law, and yet did not want to expose her to public disgrace, he had in mind to divorce her quietly. 20But after he had considered this, an angel of the Lord appeared to him in a dream and said, “Joseph son of David, do not be afraid to take Mary home as your wife, because what is conceived in her is from the Holy Spirit. 21She will give birth to a son, and you are to give him the name Jesus, because he will save his people from their sins.” 22All this took place to fulfill what the Lord had said through the prophet: 23“The virgin will conceive and give birth to a son, and they will call him Immanuel” (which means “God with us”). 24When Joseph woke up, he did what the angel of the Lord had commanded him and took Mary home as his wife. 25But he did not consummate their marriage until she gave birth to a son. And he gave him the name Jesus. There aren’t a lot of things that scare me except for the things that do. I am scared of the unknown, not knowing what’s going to happen next. I am scared of things that I can’t control. You too can make a list of the things that scare you. What is on your list? My sin is one of those things that has really scared me this week. Has that scared you too? As I think about my secret sins, I get really scared because I know what I’ve done and I’m afraid people will find out. More than that, I am also scared of what God would say about all of that. It’s a scary thing to think about. But do you see what God told Joseph? Look again at verse 21: She will give birth to a son, and you are to give him the name Jesus, because he will save his people from their sins. Jesus came to take away our sins. He came to save us from our sins. He came to save us from the punishment that our sins deserved. He came to take away the hell our sins deserved. He came to restore us and to bring us into God’s family. There is no more fear of my sins because Jesus has saved me from them. And since Jesus has saved me from my sins, he will also save me from everything else. He will watch over my life. He will give me what I need for my daily life. He is an eternal king from the line of Judah who will rule over all things in my life so that I can live with him eternally. Joseph was scared to take Mary was his wife. But did you see what happened after God spoke to him and said, “Do not fear, Joseph!” Joseph did what God commanded. How will you serve and obey Jesus today? There is no more fear! There is only freedom to do what God commands. 1. What are the things that make you most afraid? 2. Why are we sometimes afraid of our sins being discovered? 3. How does Jesus take away our fear of this? 4. What are some things we can do to serve him and other people? 1. Look at Psalm 119:25-48, especially v 32: “I run in the path of your commands because you have set my heart free.” How does freedom from fear really set us free to run and obey? Lord Jesus, your name means “Savior”, and that is just what you did, you came to save us from our sins. You are God, who came and dwelt among us, so that we might dwell with you now and forever. Help us live our lives in faith and boldness no matter what we have to face, knowing you are with us always. Amen. Older PostHe is not ashamed!